The major factors in hamstring strains are low levels of fitness and poor flexibility. Children very seldom suffer hamstring strains, probably because they are so flexible. Muscle fatigue and not warming up properly can contribute to hamstring injuries. Imbalances in the strength of different leg muscles can lead to hamstring strain. The hamstring muscles of one leg may be much stronger than the other leg, or the quadriceps muscles on the front of the thigh may overpower the hamstrings. Hamstring strains usually occur during heavy exercise. In especially bad cases, an athlete may suddenly hear a pop and fall to the ground. 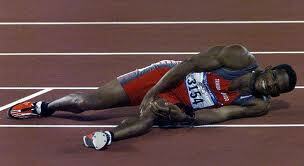 The athlete may be able to walk with only mild pain even in a severe injury. But taking part in strenuous exercise will be impossible, and the pain will continue. In less severe cases, athletes notice a tight feeling or a pulling in their hamstring that slows them down. This type of hamstring strain often turns into a long-lasting problem.